In Season 5, Molly has embarked on a new career as a writer. After selling her romance novel, Molly’s excitement is short-lived as she now faces the pressures of deadlines, taking notes from her opinionated publisher and dealing with her own insecurities. Aside from living under the same roof as his in-laws, Mike has to ride the roller coaster of being married to a published author. In the fifth season premiere, Molly (MELISSA McCARTHY) returns home after eight weeks at a writers’ workshop with great news: she’s getting published and scored a big book advance. Molly has writer’s block…and she might lose her big advance if she doesn’t cure it fast. Mike assures Molly he’ll be home in time for Christmas… until he and Carl end up in the back of a stolen truck. Meanwhile Vince upsets some Flynn family traditions. A guys-only fishing trip changes when Carl invites Victoria – much to Mike’s dismay. Molly’s work on numerous drafts of her book begins to annoy Mike and the family. Guilt sets in for Mike when he flirts with a rookie cop (guest star SARAH BAKER) and she reciprocates. Samuel contemplates moving back to Africa when he receives a letter from his parents saying they’re struggling financially. Molly urges Mike to go to the doctor when she learns that he hasn’t been in over a decade. The 100th episode was directed by series star Melissa McCarthy. Molly faces a dilemma when her publisher asks her to make a provocative change to her book. Mike is forced to arrest Joyce for a DUI after she refuses to take a breathalyzer test at a checkpoint. Mike & Molly are excited to finally have the house to themselves for the whole weekend. Molly plans a party for Peggy after hearing that she’s suddenly retiring. Excited that her book is finally out and available for purchase, Molly worries that no one will buy it – by obsessively refreshing the book’s website to see if its selling. Peggy makes Molly do chores in exchange for sharing tantalizing stories from her past for Molly’s second book. When Mike hits a personal best weight loss goal, he makes the risky decision to indulge in a slice of pie. Molly is nervous about Mike attending a celebratory party her publisher is throwing for her and Peggy. And Mike’s feelings are hurt when she doesn’t want him to go. Molly surprises Peggy by reuniting her with her estranged sister, Rosemary (guest star MARGO MARTINDALE), when they take a road trip to Peggy’s hometown of Mudlick. When Peggy’s depressed friend Kay (KATHY BATES) returns to town, Molly is determined to find a way to lift her spirits. Mike meets his Aunt Rosemary (MARGO MARTINDALE) for the first time and is instantly smitten by her warmth and positive attitude – which is the polar opposite of his mother. When Molly gets angry with Mike for not listening to her vent about writing with Peggy, they go their separate ways…for a day. After Carl has a near-death experience while on duty, he tells Mike he’s going to propose to Victoria. But can Mike keep a secret? 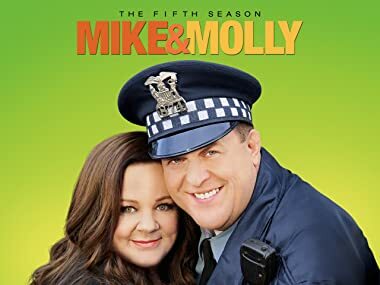 On the fifth season finale, Mike and Molly are forced to “uninvite” Carl to their anniversary cruise following his nasty breakup with Victoria.